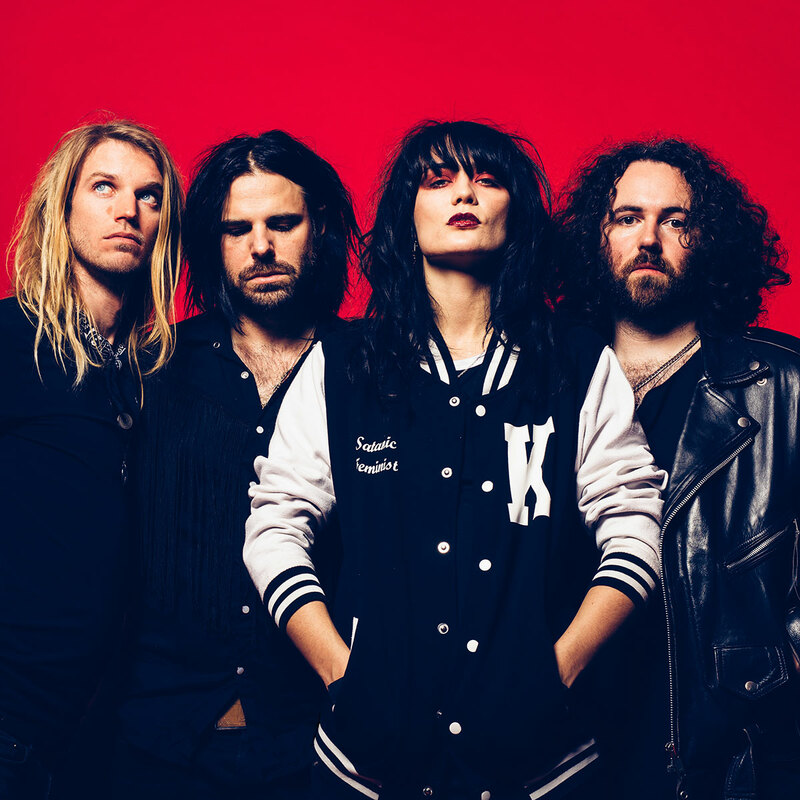 Musically unshackled and ferocious in their intensity, Saint Agnes fuses menacing, frenzied rock with dark anthemic flare. Born in a dingy sub-zero flat, the band are rife with themes of wild fantasy, escapism, emotional fragility and the inside-outs of living in East London. Now in 2019, the gates of Saint Agnes’s quasi-fictional sin city are flung open. Consisting of Kitty Austen (Vocals/Guitar/Keys), Jon James Tufnell (Vocals/Guitar), Ben Chernett (Bass) and Andy Head (Drums) – Saint Agnes have clocked up over 200 shows across the UK & Europe already. 2018 laid the foundations for what is set to be a breakout year for the band, playing the mainstage at Kendal Calling, receiving radio support from Tom Robinson (BBC 6 Music) and John Kennedy (Radio X), as well as festival appearances across Europe and sold out headline shows at The Lexington, and Borderline in London. I remember we were driving in Italy on tour and this came on and everything felt peaceful and right with the world. Those moments are rare and special and it takes me back to that feeling every time I hear it. It’s a beautiful song. Naming the first song off your first album after your band is a bold move. Bold and glorious. I always imagine kids in the 70s buying that record, racing home with it, sitting alone in their room, putting it on and being simultaneously terrified and thrilled by what they heard. A gothic western masterpiece hiding in a garage rock n roll song. It’s the blueprint for Lola Colts’ dark, visceral soundscape and I love it. I remember hearing the demo and knowing I wanted to be in that band. I read something recently letter from Love’s band mate, Melissa Auf de Mer, where she describes Courtney as wearing nothing but a slip and some red lipstick but being able to stand up to the devil himself with power and rage like nobody else. That’s the coolest thing I’ve ever heard and 100% true. I remember playing a show with an old band that had not gone well. I was surrounded by drunk students with the DJ playing terrible music and felt totally out of place just waiting for it to be time to go, then out of nowhere this song came over the PA. It sounded glorious and I have been a huge fan ever since. The sparse verses, the powerful chorus and the noisy guitar solo are perfect and have been endlessly inspiring to me. The album this track is from (Astro Creep 2000) creates a world that you live in for the duration of the record, something we have tried to do too. I’ve always loved how on this record they took what is great about metal, the weight and the energy, but took away some of the cliches, combining elements of The Cramps or Nine Inch Nails and fusing it with their sound. Sneaking in some metal without being trapped by the genre is something we try and do a lot. Silvertown is a real place where the band started as well as a fantasy world, a heightened reality that we use as a backdrop for our stories on the rest of the album. This song sets up the musical and lyrical language for the rest of the album. That’s why we released it first and why it opens the record.